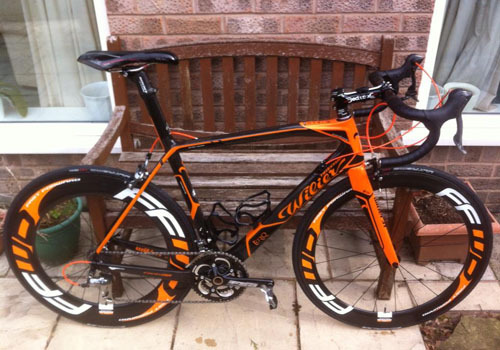 Six weeks prior to my first triathlon of the season, disaster struck. I twisted my ankle quite badly in a warm up for a running race. The recovery went well and within a couple of weeks I was back on the bike and jogging a little. After 4 weeks I was able to resume almost normal training with only discomfort coming with kicking in the pool. I came into the race on Sunday with no assumptions of winning or performing to my maximum ability due to my injury. I came to get back into the racing environment and to see how my ankle performed under a reasonable amount of stress. Having arrived in Holmfirth, I registered and went to set up in transition. There were a few negative exchanges between athletes about the wind, but at least the sun was shining. I was feeling good and looking forward to stretching my legs in a competitive environment. The race started and I took the swim at a fairly steady pace to ensure I didn’t cause too much pain or damage to my ankle. It was a 400m swim in a 20m pool and I had to keep reminding myself to do 20 lengths not the usual 16 lengths I am used to in a 25m pool. Thankfully I kept count and jumped out of the pool and headed to T1. Due to the hill straight out of transition I put my bike shoes on in transition rather than having them pre-clipped in as per my usual routine. This didn’t slow me down too much and I headed out onto the bike straight into a strong headwind with gusts up to 40mph. It was only a mile or so until the first steep hill. I shifted into the small chainring and stood up to keep my speed up the hill. As I stood up, something went wrong. I couldn’t turn the pedals. Thankfully I wasn’t moving quickly (uphill) and managed to put my foot down preventing me from falling over. I looked at the rear wheel and noticed the quick release had come undone and my rear wheel had come out of the dropouts. During the repair time I was passed by a good number of athletes and I figure that I lost at least three minutes with this issue, one that I will be sure to check doesn’t happen again. 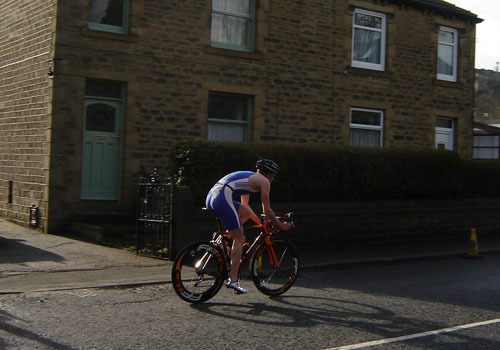 I soon re-started on the bike and set about putting an effort in to catch the athletes who had passed me. I reminded myself that this was my first race of the year and to take care of my ankle. As such I made sure I didn’t put max effort in at any point to ensure I had plenty left for a solid run. The wind was great when it was a tailwind, but brutal when it was a head wind and I was glad to dismount and begin the run. I quickly got into a good, sustainable rhythm and was pleased that my ankle wasn’t giving me any grief. I pushed on a little, determined to have a good race. I caught another athlete toward the end of the run and I crossed the line. Excluding the mechanical on the bike, I felt I had a solid race and placed 2nd in the swim split, 12th in the bike split and 3rd on the run split. I won my age category (20-29) and came in 6th overall. I am pleased with my result considering how my ankle was not too long ago and the issue I had on the bike. I have a few time trials coming up over the next few weeks and my next triathlon will be in May after another week of warm weather training in preparation for the European Championships in Turkey in June.